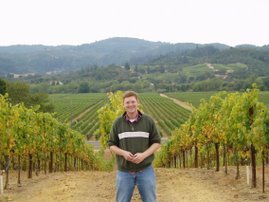 I'm always looking for new ways to provide interesting wine ideas to my readers, so when Fleming's Executive Chef Patrick Quackenbush approached me about doing a wine list for the Holiday's I was thrilled. Patrick Quakenbush, amicably referred to as Chef Quak, was born in Sycamore, IL to an Air Force family, spending his first 10 years in Wiesbaden, West Germany. His European travels exposed him to exotic foods at a young age, which shaped his love of food. Quakenbush returned to the U.S. and studied Restaurant Management at Ohio State University, while simultaneously working at Dalt’s American Grill. After graduation, Quakenbush moved to Orlando, where he became a Sous Chef at Planet Hollywood of Walt Disney World. For four years, he prepared meals for 6,000 people per day and earned Chef of the Quarter 4 times with a Silver Star. He went on to open sister restaurants in Las Vegas and Melbourne, Australia. Quakenbush followed his General Manager’s lead and left Planet Hollywood for a position at Jimmy Buffet’s Margaritaville at Universal Studios Florida. He opened another Margaritaville in Ochoa Rios, Jamaica, earning Manager of the Year along the way. He then joined NBA City, a sister company to Hard Rock, as an Executive Chef at Universal Studios. In an eclectic city like Chicago, dinner party menus are vast and varied, making it difficult to pick the perfect wine for everyone on your list. * Joel Gott, Napa Valley Chardonnay ($15) – Chardonnay is popular among both wine enthusiasts and casual drinkers, and therefore, always a good choice. Joel Gott uses stainless steel tanks for fermentation, preserving the natural pear, stone fruit and mineral characteristics created by the cool climates of the southern Napa Valley vineyards. As a result, this wine has a fresh acidity and clean finish, making it a great pairing for a variety of food. * Niebaum-Coppola Sophia Blanc de Blancs ($20) – This distinct blend of Pinot Blanc (70 percent), Sauvignon Blanc (20 percent) and Muscat Cannelli (ten percent) produces a floral sweetness that appeals to a broad range of tastes. Wrapped in cellophane, Sophia is a perfect ready-to-go gift that displays playful sophistication. * 2003 Qupe Syrah Central Coast ($20) – This wine also pairs with a multitude of foods. The 2003 vintage has a bit more body than previous years, but still releases a forefront of fruit and aromas of hardspice, black pepper, berries and hints of lavender and licorice. * A to Z, Wineworks Oregon Pinot Noir ($20) – The name comes from its blending – the grapes could be sourced from any Oregon winery, from A to Z. Blended from at least 16 different Oregon vineyards, this wine is light and easy to drink, pleasing almost any crowd with aromas of bright red fruit, spices and earthy undertones. * Vineyard 29 Cru, Napa Valley, Cabernet Sauvignon ($50) – If you’re looking to impress your host, this Cabernet Sauvignon is a great choice. This royal pedigree yields a wine truly fit for a king. Deep and complex, this wine starts with ripe dark fruit, toasty vanilla and creamy caramel, then moves to roasted coffee cassis and dried flowers before finishing with a touch of earthiness and spice. * ZD Reserve Napa Valley Chardonnay ($55) – Its name is derived from the founders, Gino Zepponi and Norman de Leuze, but it also stands for Zero Defects. This Chardonnay is their signature wine, known for its non-malolactic fermentation. Malolactic fermentation is a secondary fermentation that occurs after the sugar has fermented to alcohol. By preventing this, the wine retains a forward fruit flavor and crisp, natural acidity. A unique choice that will wow any social gathering. * 2001 Silver Oak Cabernet Sauvignon Alexander Valley ($70) – Silver Oak is a wine most people recognize, making it an impressive gift. Fruit-driven and full-bodied, this wine has a long, lingering finish, with a complex nose that ranges from black cherry to ginger. If properly cellared, this wine will continue to improve for a decade or more, giving your host an extraordinary treat to look forward to. * 2002 Quintessa ($100) – Though one of the more expensive wines, the Quintessa proves to be perfect for the person who has everything. This wine is a meritage, a blend that consists of the five classic Bordeaux varietals: Cabernet Sauvignon, Merlot, Cabernet Franc, Petit Verdot and Carmenere. The 2002 vintage is excellent now and will continue to improve in the bottle for the next five to ten years, giving your host the option to serve now or save for later.